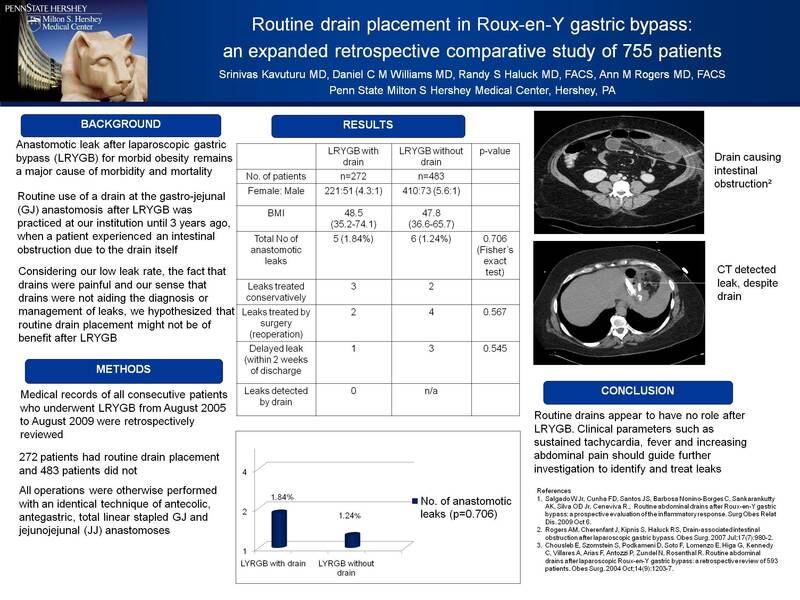 Routine Drain Placement in Roux-en-Y Gastric Bypass: An Expanded Retrospective Comparative Study of 755 Patients. Aim: Routine use of a flat, perforated bulb-suction drain after laparoscopic Roux-en-Y gastric bypass (LRYGBP) was practiced at our institution until 2 1/2 years ago, when a patient experienced an intestinal obstruction due to the drain itself. Considering our low leak rate during the period in which drains were used, and evidence that drains were painful and of little clinical use, we hypothesized that routine drain placement at the gastrojejunal (GJ) anastomosis might not be of benefit after LRYGBP. Methods: Medical records of all consecutive patients who underwent LRYGBP from August 2005 to August 2009 were retrospectively reviewed. Complications, particularly relating to leaks, were compared between the two groups. Among the patients with drains, five experienced a leak (1.84%) and among those with no drain, there were six leaks (1.24%). The first set of patients was evaluated for the drain’s ability to detect or treat a leak, either by a change in the nature of drain output, or by the drain’s ability to control and contain the output. As we changed our drain placement practice in January 2007, we have 1 1/2 years of 272 cases with a drain and 2 1/2 yrs of 483 cases without. All operations were performed with an identical technique of antecolic, antegastric, total linear stapled GJ and jejunojejunal (JJ) anastomoses. Leak rates were studied and compared between the two groups. In addition, the effectiveness of operatively placed drains was evaluated. Results: A total of 755 cases of LRYGBP were performed during the study period, including 632 females and 123 males (ratio=5:1). The average BMI for the drain group was 48.5 and that of the non-drain group was 47.8. 272 cases were performed with drain placement at the GJ anastomosis and 483 were performed without. Among the drain group, 5 patients had a post-operative leak from the GJ or JJ anastomosis (1.84%). 6 patients experienced leaks in the non-drain group (1.24%; p=0.706, not statistically significant). Among the 5 leaks in the drain group, 2 patients underwent exploration, drainage and repair, and 3 were treated non-operatively. Among the 6 leaks in the non-drain group, 4 patients underwent re-operation and 2 were treated non-operatively. Delayed leak (within 2 weeks after discharge) was seen in one patient in the drain group (0.36%) and three patients in the non-drain group (0.62%; p=0.545, not statistically significant). Re-operation rate in the two groups (0.73% and 1.03%) was also not statistically significant (p=0.0.567). Finally, in none of the drain patients who experienced a leak was the drain able to diagnose or treat it. Conclusion: Routine drains appear to have no role after LRYGBP. Clinical parameters such as sustained tachycardia, fever and increasing abdominal pain should guide further investigation to identify and treat leaks.